Did you know that the Pacific leatherback sea turtle swims 6,000 miles across the Pacific Ocean to feed on jellyfish that are abundant along the California coast during summer and fall months? 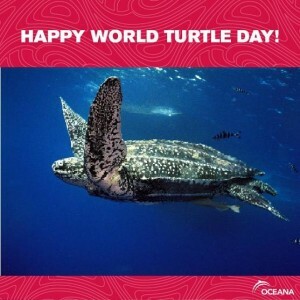 Today is World Turtle Day and although it is a celebration for all species of turtles on land and in the sea, I’m taking this day to celebrate the Leatherbacks. I have been reading research articles and press releases, watching videos and documentaries, and generally just familiarizing myself with the largest marine reptile. Even with protections under the Endangered Species Act, the government estimates that as many as 50,000 sea turtles die each year due to fishing gear such as longlines, trawls, gillnets, and dredges. This is a figure that breaks my heart but fuels the fire for making a difference for the majestic species. How can you help? By not leaving trash on the beach and keeping an eye out for them if you boat in areas where they live. If you are near nesting beaches, follow lighting restrictions so you don’t disorient hatchlings, and refrain from spending time on the beach in areas where you can disturb them. Reducing your use of plastics, particularly plastic bags, helps keep it out of the oceans and out of sea turtle’s stomachs. Also, make sure to know how your fish was caught by eating only sustainably harvested seafood to limit support for fishers with by-catch. This entry was posted in Uncategorized on May 23, 2013 by Malcolm.